Measles is a highly contagious viral disease, which affects mostly children. It is transmitted via droplets from the nose, mouth, or throat of infected persons. Initial symptoms, which usually appear 10-12 days after infection, include high fever, runny nose, bloodshot eyes, and tiny white spots on the inside of the mouth. Several days later, a rash develops, starting on the face and upper neck and gradually spreading downwards. There is no specific treatment for measles and most people recover within 2-3 weeks. 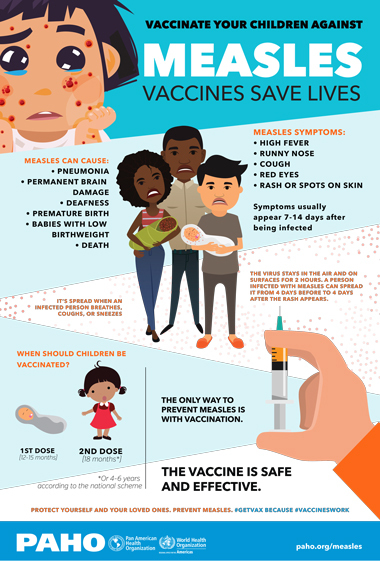 However, particularly in malnourished children and people with reduced immunity, measles can cause serious complications, including blindness, encephalitis, severe diarrhea, ear infection, and pneumonia. Measles can be prevented by immunization.